Today’s page is one of retrospection. Occasionally I think about riding and racing and how it was when I was active. I figured I’d put a few of these thoughts down as a page on my blog. It’s kinda like an artist doodling or doing a rough sketch, then polishing up the few that might be interesting. Thought One. Riding a motorcycle requires good fine motor control. Racing requires excellent fine motor control. So many things that a rider has to do must be done delicately. Easing out the clutch, settling into a turn, coming to a stop, applying the throttle, etc., all need to be done smoothly for things to go well. Years ago I took a refresher New Rider Class and one of the students lacked fine motor control. Everything he did was abrupt, too strong, over-amplified. In Oregon you can get a motorcycle endorsement by passing the DMV’s test or by passing the New Rider Class. He said it was the third time he had taken the class and somehow this time he finally passed. He was going to get his endorsement and take his Sportster out of his garage and ride, he said. My thought was he’s going to hurt himself. I hope he takes no one with him. It’s even more important in road racing. Racers are so often right on the edge of adhesion of their tires. There’s a fraction of a millimeter lever movement between braking at the maximum and locking up the front wheel. Accelerating out of a turn requires a deft touch with the throttle. There are only a few degrees of rotation difference on the twist grip between getting the best exit speed or losing the rear and crashing. Modern bikes have electronics to help the rider, anti-lock brakes, traction control and the like, but I’m sure riding or racing well is still a matter of fine motor control. They are not just round black rim protectors. Firstly, they are part of the suspension, the first part that touches the road. Over- or under-inflated tires can upset the balance. Secondly, profiles, construction and tread patterns matter. Let me give you two examples from my experience. 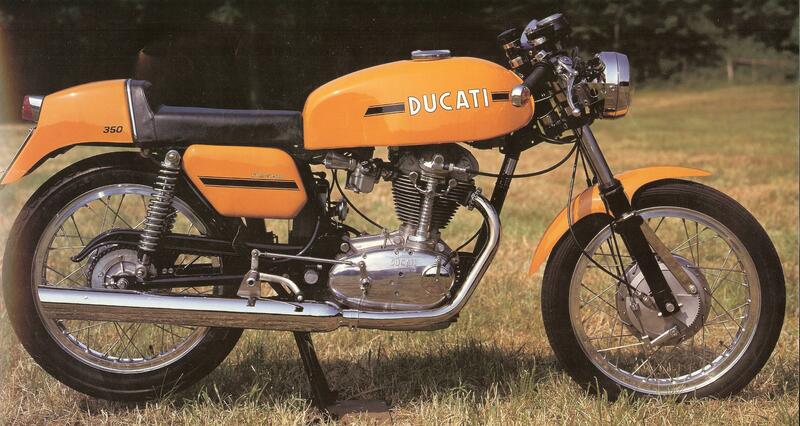 Many years ago I found a dealer in Canada who sold me a 1974 350cc Ducati Desmo, a little single cylinder cafe racer that wasn’t available to U.S. dealers. I was racing a 350cc Ducati at the time and it handled really well. The Desmo street bike didn’t handle as well as I expected even though it was basically a mildly turned version of my race bike, with lights and a horn of course. The Desmo didn’t handle badly, but there was a little bit of vagueness I didn’t expect and didn’t like. I looked at the differences and similarities between the two and the big difference was tires. The Desmo was fitted at the factory with an old fashioned rib pattern front and a rear tread known as “universal.” I bought a pair of the most popular sport bike tires at the time, the Dunlop K81, and replaced the OEM tires. BIG difference. The little Desmo now went exactly where I pointed it. When I was racing the Ducati Superbike for Dale we used Goodyear racing slicks. There was a point in 1978 when a labor dispute meant we could not get tires from Goodyear. The only other road race slick at the time was from Dunlop so we mounted a pair on the 883cc Ducati Superbike and went to a club race at Sears Point. I didn’t like the Dunlops. I was slipping and sliding all over the place, especially exiting corners. However, when I got off the track and checked the lap times Dale was recording, I was getting around the track nearly as quickly as I did with the Goodyear slicks. I told a more experienced racer about this and he told me what happened was on purpose. “The Goodyear slicks are designed to hold tight right up to the limit of adhesion, then they let go suddenly,” he told me. I had definitely experienced that. “The Dunlops are designed to slip a tiny bit to warn you the limit is about reached. If you push it farther they will lose traction,” he explained. Riding or racing, tires can make a big difference. Choose wisely, and keep them inflated at correct pressure. Thought Three. Getting good starts. During my pro career in all the AMA races, either heat race or final event, I only once got a good start. Usually it was pretty mediocre. The one exception was the 1978 Laguna Seca National heat race, when I got away in 2nd place. I never knew what I did right that time. I blew the start at the next day’s final event. I always seemed to be landing in 5th or 6th place and having to work forward. My starting procedure was to hold the RPMs near redline just before the flag was waved, then let out the clutch as quickly as possible while keeping the front wheel on the ground. I thought that was what everyone was doing. Several years after I had stopped racing I was reading a road test in a magazine. Road tests in those days always showed actual 1/4 mile times and top speed, not just print the manufacture’s claim. The magazine had, in this case, employed a veteran drag racer to run the 1/4 mile tests. The journalist writing the article had put in a side bar where he asked the dragster, how do you get a good launch? Laguna Seca Superbike start circa 1983. Mike Baldwin, Wes Cooley, Wayne Rainey. Photo by Kendal Mullins. Duh. Start at the bike’s torque peak. Of course. Torque is acceleration, horsepower is top speed. The torque peak is typically at fewer RPM than the HP peak, which is usually near redline. Our Ducatis had their HP peak near 8,000-8,500 RPM but the torque peak was closer to 7,000 RPM (Dale never did put the Ducati superbikes on a dyno). All those starts I was starting at the wrong RPM. If only I’d known I probably would have had a little better results. Sigh. Thought Four. Things that make for a good ride. There are great motorcycle rides and there are good motorcycle rides. There are. I guess, even average motorcycle rides. There are no bad motorcycle rides (some rides end badly, but the bad ending really isn’t part of the ride). What are the ingredients of a good ride? There are several. The road. A nice twisty road with good pavement can make for a good ride. You can work the road, or attack the road, or get in sync with the road and surf its curves. If the road requires your focus it’s either a good road or it’s way overdue for repaving. The environment. Really, one of the best things about riding is that you are in the environment you are passing through. You can feel changes in temperature, shifts of the wind, the smells in the air. These things add texture to the ride, if you will, making it more memorable. Even if the road is boring and there’s nothing worth looking at, there is something about the sound of the wind and the thrum of the tires on the pavement that, for me at least, encourages meditation. My mind wanders from thought to thought, or thinks of nothing at all. Sometimes a solution to a problem will magically appear when I didn’t even realize I was thinking about the problem. Um, I take back my original statement that there are no bad rides. You need tp have the appropriate motorcycle. I remember a ride with my first bike, a Honda CB160, from Bakersfield to Berkeley on the freeway. Holding the throttle wide open to keep up to freeway speeds while fighting the wind was no fun. I was a novice street rider and didn’t know any better, but I learned to never take a long ride with that little bike again. Thought Five Is being left-handed an advantage? I noticed this at the Laguna Seca Ducati Island in 2008. There was a panel of racing stars signing autographs: Cook Neilson, Phil Schilling. Doug Polen, and Larry Peagram (who was campaigning a Ducati in AMA Superbikes at the time). Counting me, four lefties, one rightie (Larry). Yes, I know Phil Schilling is known more as a tuner than a rider, but he did race at the club level before he became the tuner of the California Hot Rod. This made me wonder. Valentino Rossi is a lefty. I’m pretty sure Freddie Spencer is left-handed, as is Ducati star Troy Bayliss. Rossi, Bayliss, and Polen are champions. Cook, Phil and I are not champs, but we won some races. Does being left-handed give us an advantage? Some people have looked into this, specifically for motorcycle racing, other forms of racing, and life in general. If you’re interested take a look at http://www.visordown.com/features/to-be-a-world-champ-you-need-to-be-left-handed/24007.html. It not just motorcycles either. Indy cars? See http://www.roadandtrack.com/car-culture/a4518/the-road-ahead-lefties-in-indycar/. The web is full of articles talking about the advantages and disadvantages of being left-handed, and some claim lefties excel in motor skills. Hmmm. See Thought One, above. That was thought provoking Paul and well written. Smart and interesting observations. While I’ve never raced my bikes, I have taken them to the track (in NJ) and ridden them at the limits of my ability. All your points accord with my experience.